We are celebrating the arrival of Spring and the Grand Opening of our 2 new Showhomes with our biggest price rice reduction on our move-in ready Morris and Single-Family Homes. For a limited time until the end of Spring, we have reduced these home prices by $10,000 to $20,000. We currently have 3 Single-Family Home Models and 2 Morris Laneway Homes for you to choose from on Greyeyes-Steele Way. Choose between these perfect homes and move in this Spring. All these homes are even roughed in and designed to allow for a legal basement suite with separate entry. This Clarke home features a beautiful craftsman exterior with durable James Hardie siding in a rich iron grey colour accented with white trim and board and batten. 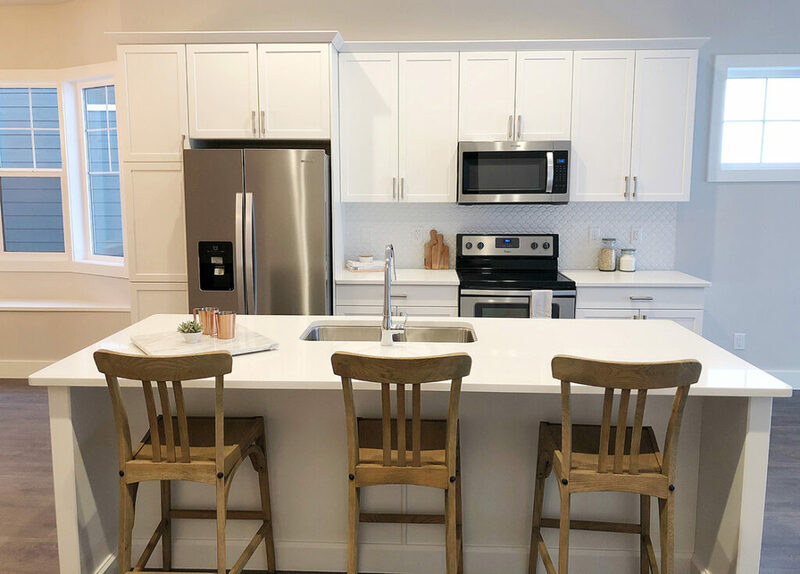 White shaker cabinets with a neutral subway tile backsplash, white quartz countertops and stainless steel hardware provides the classic kitchen for entertaining in an open-concept plan. This Clarke home is our newest style with a contemporary exterior combining two-tones of James Hardie siding colour and a low-pitched roof. 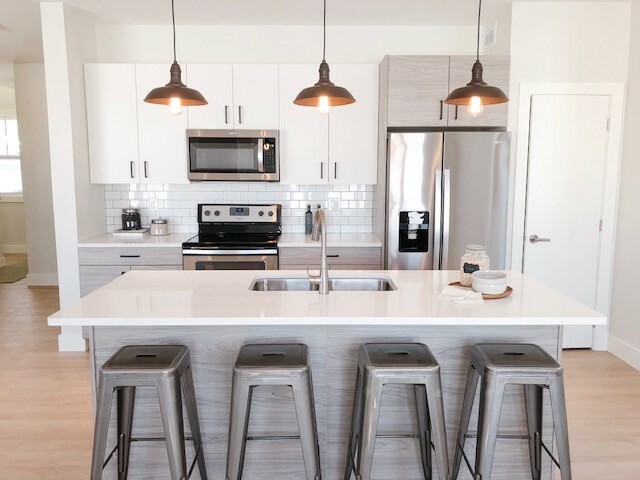 Combining modern flat panel white upper cabinets with wood grain lower accents, black hardware and pendant lights, plus classic white subway tiles and quartz countertops, gives this home a custom feel. This popular style Brady home model features a beautiful grey slate James Hardie siding on the exterior and a timeless white shaker style kitchen with white quartz countertops. A beautiful white arabesque backsplash adds just the perfect amount of flair to this kitchen customized by our Arbutus designer. 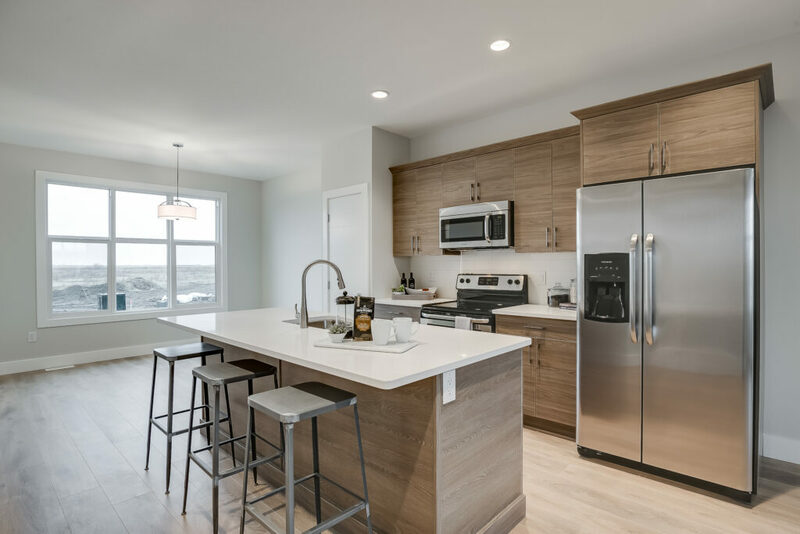 Our popular Morris home at 142 Greyeyes-Steele Way features our mocha interior scheme with flat panel walnut wood-grain cabinets and classic white quartz countertops and backsplash. 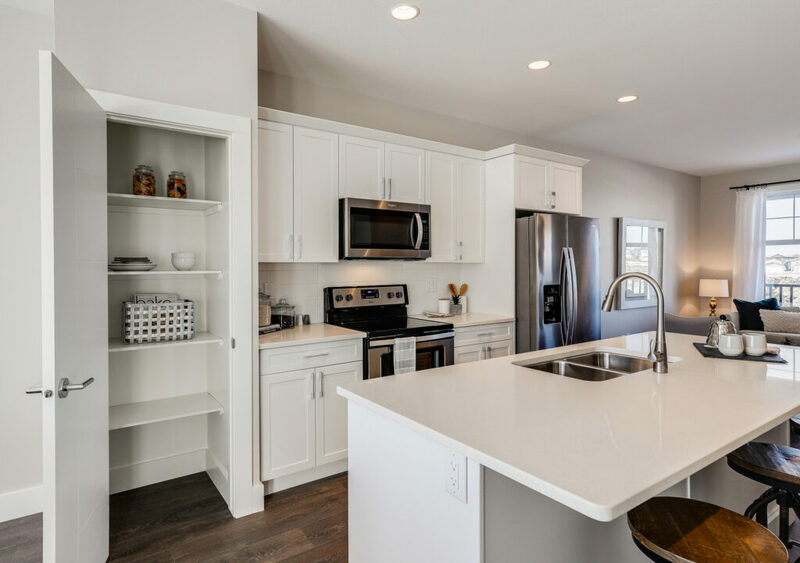 Wide wood plank laminate flooring, tile entry and bathroom floors and stainless steel kitchen appliances are all standard in our Morris homes and included in the price. Stand out on the block with this beautiful Morris home at 154 Greyeyes-Steele Way with red James Hardie siding accented with cedar shakes. 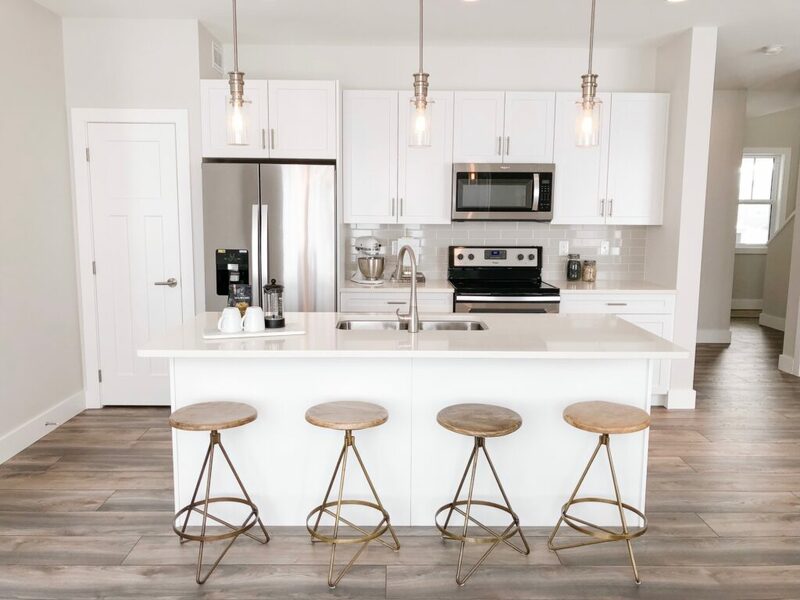 The interior finish features our latte scheme with classic white shaker cabinets and luxury finishes such as quartz countertops and stainless steel kitchen appliances all included. Enjoy this timeless home for years to come. We hope that you will find one of these houses to be your perfect home to move-into this Spring. This limited time offer ends on June 20, 2019. We hope that you will join us celebrate the Grand Opening of our 2 new Showhomes on April 13th and be inspired to find your own home. For more information, visit any of our Showhomes or contact us to schedule an appointment. We would be happy to accommodate your schedule.